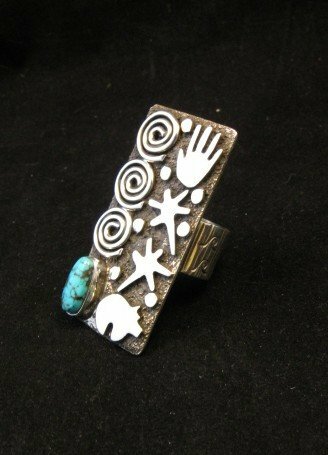 Here's a great turquoise and sterling silver ring from well-known Navajo artist Alex Sanchez. 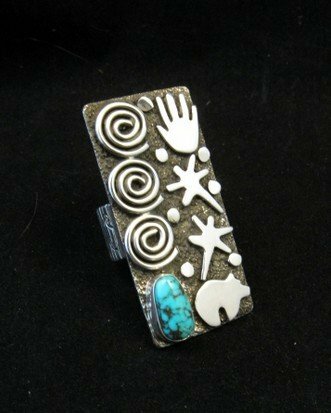 The ring showcases the stunning silver work that has become the hallmark of Alex's work. 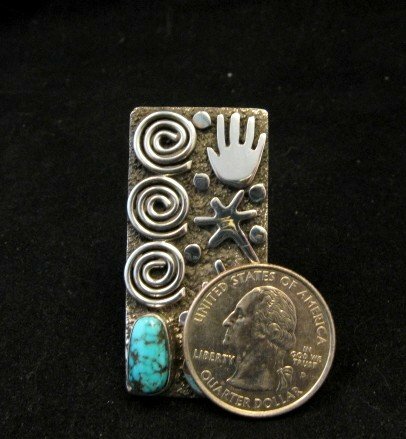 This heavy-gauge ring features a natural deep blue Kingman turquoise stone with black matrix. 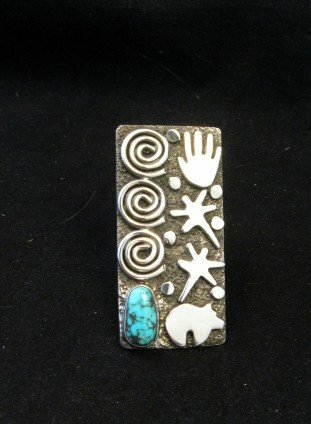 This one-of-a-kind piece was created in his petroglyph style - heavy, textured, oxidized sterling silver decorated with all kinds of the applied silver symbols: dragonflies symbolizing beauty, a sacred bear for protection, a healing hand and three whirlwind spirals. The back(inside) of the ring is hand-stamped and the 1/2 inch wide ring band is textured and hand-stamped with the same design as inside the back of the ring. 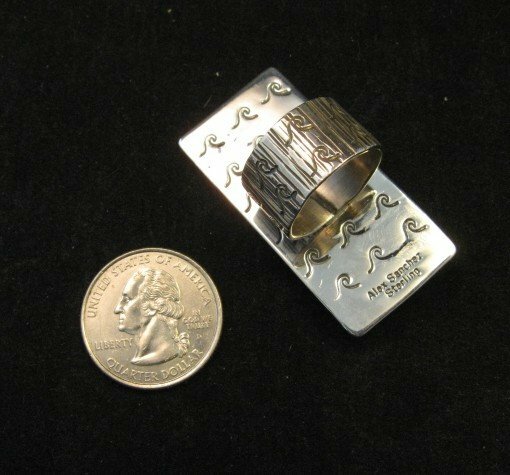 The face of the ring measures 1-7/8 x 7/8 inches and the ring weighs 25.5 grams. Size 7-1/2. Brand new in perfect condition. Stamped with Alex Sanchez's hallmark. Certificate of Authenticity included and gift box included. Alex is the younger brother of Myron Panteah. He's the winner of many awards for his innovative one of a kind designs and his work has caught the attention of collectors everywhere.